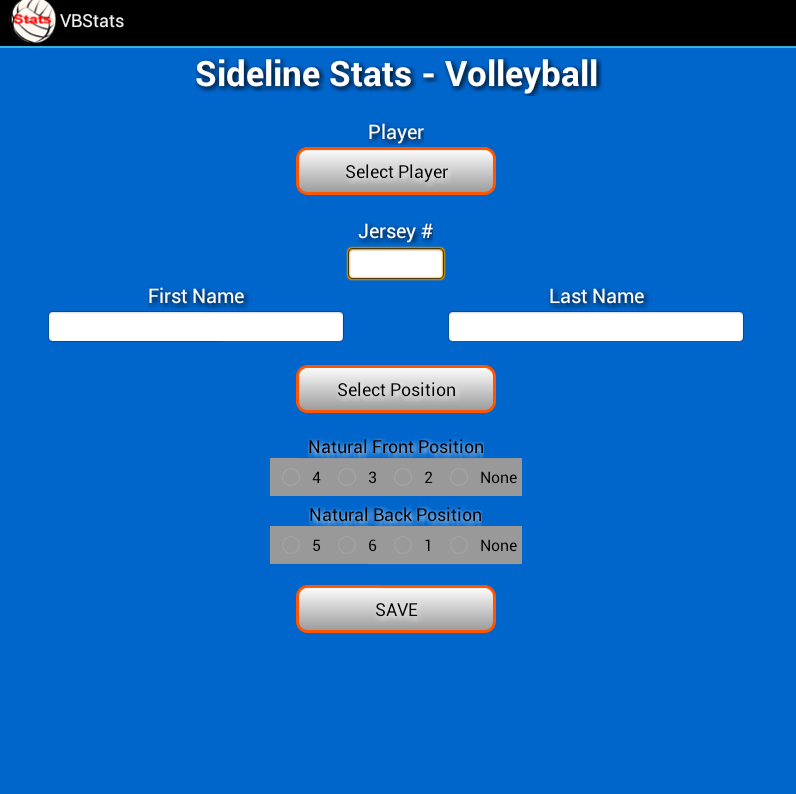 Data Input: The first time you enter Sideline Stats – Volleyball, you are presented with a Dialog to add a team (see Figure 1). Normally this is were you select which team you want to work with, but since there is nothing in the database, the only choice is to ‘Add Team’. 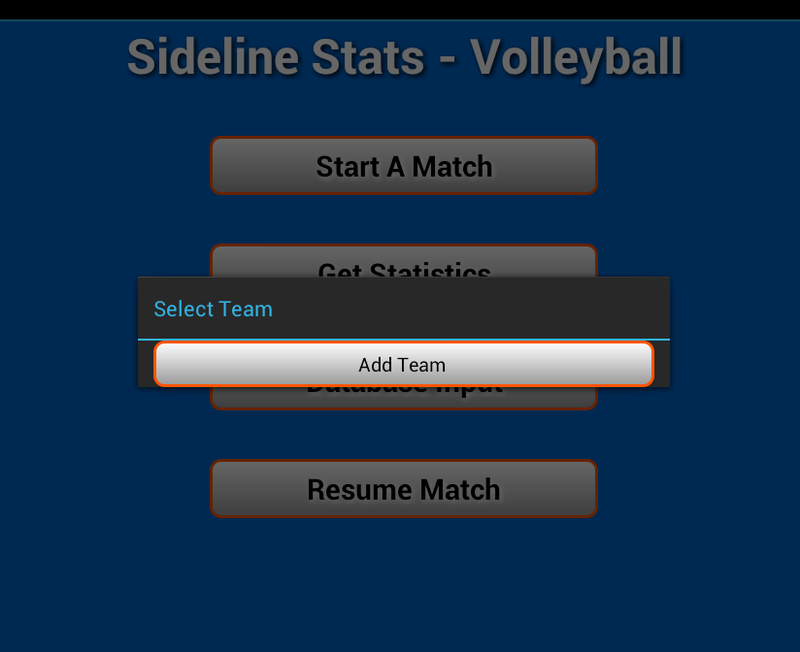 Once selected, you will be presented with a dialog to enter the team name and the level of the team (fig. 2 & 3). If a team was already created, you would be presented with a list of teams created. Once a team is selected, it is used throughout the reset of the program. If you want to change the team, use the menu options from this window. The team name can be anything, as well as, the team level. In this example we use “The A Team,” for the team’s name and “Varsity” for the team’s level. Level can be used to differentiate between teams with same names. Once the new team name and level have been defined, it is now time to create the team roster. 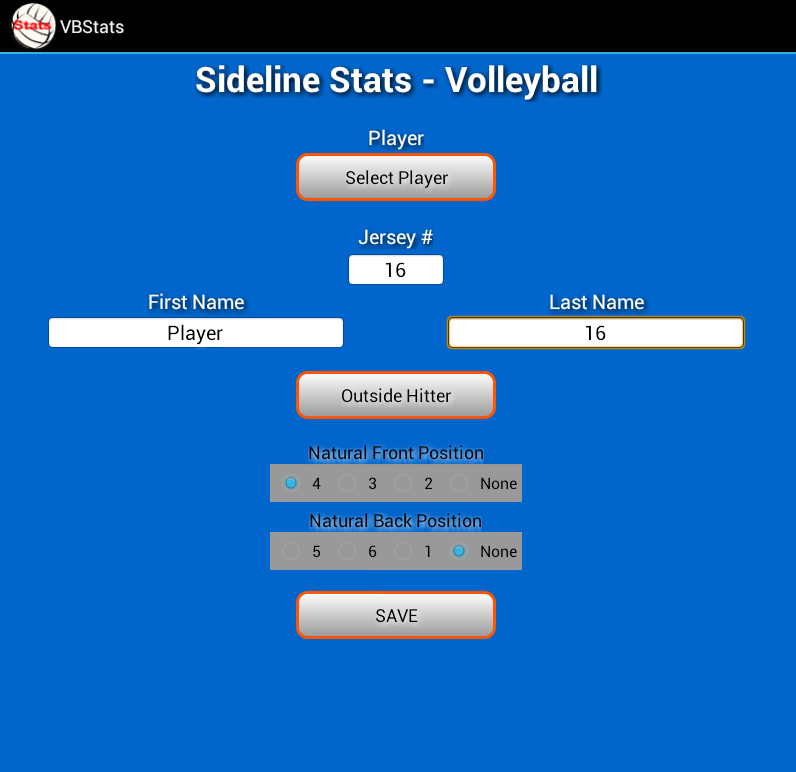 Creating Team Roster: Figure 4. shows the form used to define a player on the team. To start inputting players or for editing players already defined, press the ‘Add/Update Player’ button. A select player dialog (Figure 5 ) will pop up allowing you to select a player that is already on the team, select adding a new play, select adding an existing player that is on another team, or add a player that is in your contact database. If an existing team player has been selected, the player form will be filled out with all the current database information. Changes can be made to any field. If a player’s name is changed and this player also plays on another team within the program’s database, the name will be changes for all teams the player plays for. All other field are only associated with the current team. When ‘Add An Existing Player’ is selected, you will be presented with a list of all other players within the program’s database. 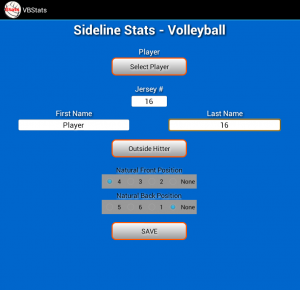 As before, once an existing player is selected, the player’s form is filled out with all existing data. Editing any field and saving will add the player to the team. When the ‘Add New Player’ button is pressed, you will be asked for the Jersey number. 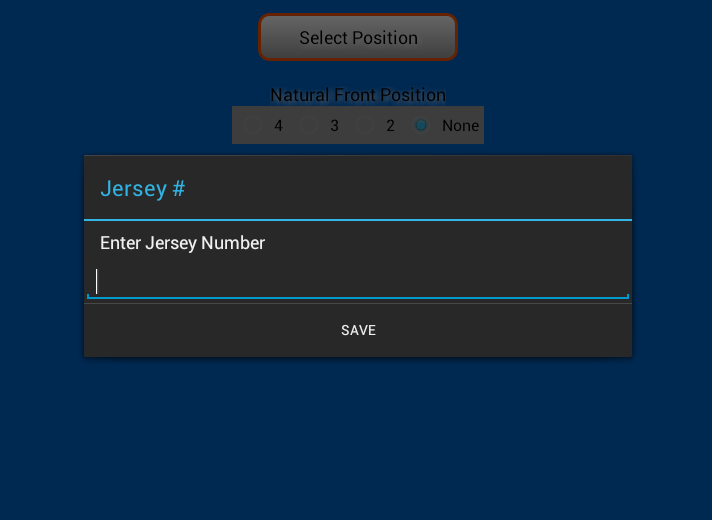 Once the jersey number has been entered and saved, the players form is filled out with the default setting. The first name is ‘Player’ and the last name is the jersey number. These fields can be edited to their correct names at any time. The next step would be to define the players position. 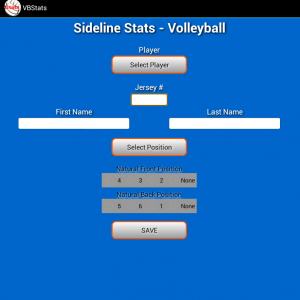 By pressing the ‘Select Position’ button, a list of volleyball positions are presented. Choose the appropriate position for the player being added. The last step is to define the natural playing position of this player (See Figure 7). This defines the normal court playing position for the player when they are in the front and back row. In figure 7 we see the player normally plays in position 4 in the front row (e.g. outside hitter) and has no preference in the back row. This information is used to move players to their natural normal positions once play has started. When the form is complete (see figure 8), pressing the save button will add the player to the team. You can add as many players as you want, but will be warned when exiting if fewer than 6 players exists in the team.